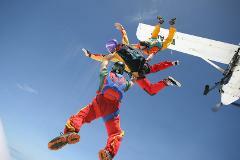 [With Shuttle Service - Free Transfers] Skydive up to 14,000ft no more to pay. Drop into our exclusive skydive departure lounge located at 196 Elizabeth St, Sydney. 350m from Central Railway station. [Own Transport - Self Drive] We offer the best service, value and fun skydive if you are looking to do a skydive in Sydney. Up to 14,000ft no more to pay. Closest skydive to Sydney.